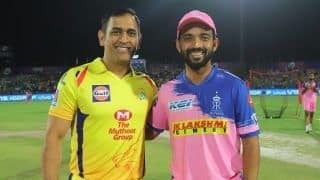 Hello and welcome to our live coverage of Match 26 of the IPL 2019 between Rajasthan Royals and Chennai Super Kings at the Sawai Mansingh Stadium, Jaipur on Thursday. Unbelievable scenes here at the Sawai Mansingh Stadium in Jaipur! Mitchell Santner, you beauty! He has come into the team and taken his team across the line when he was given the opportunity. That is the might of this side, some one or the other always ends up putting their hands up and taking Chennai to victory! Over 17: Terrific over from Jofra Archer. Manages a nasty bouncer as well against MS Dhoni. Beaten for pace. 113/4, 39 off 18 balls. Over 15: Big over this. Six and four by Ambati Rayudu off Jaydev Unadkat. That’d fifty up for Rayudu as well. 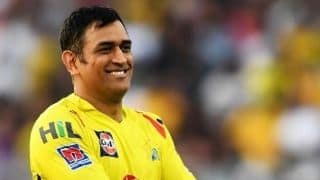 100 up for CSK. 100/4. 46 off 24 balls. It was a good bowling performance from the collective standpoint. Barring Tahir, who remained relatively economical, rest all chipped in with the wickets. Jadeja was the standout with his 2/20. The fielders was on it too as they backed their bowlers will with their athleticism, but that final over would make them feel a little disheartened. Still, despite that, it’s a good batting surface and Chennai will back themselves to chase this down. Let’s see how it goes. 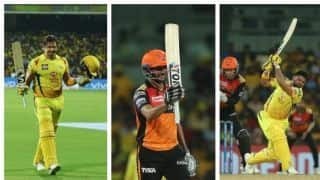 It was mostly Chennai through the innings, but that last Shardul Thakur over, which went for 18 runs, could just be the psychological edge Rajasthan need in the second half of the game. The hosts got off a fast start with Buttler and Rahane firing away, but they kept losing wickets at regular intervals. After a point, the away side was on top, right up till the point where Thakur conceded 18 runs, with Gopal hitting the bulk of them. Over 14: Debutant Riyan Parag on fire. He is the third youngest player to make his IPL debut after Prayas Ray Barman and Mujeeb ur Rahman. Full toss and it has been put away! Good shot, pikced the spot nicely. On the pads, Riyan flicks it over the mid-wicket fielder. No one in the deep and a boundary. Much-needed one. Another FOUR! Could have easily been a caught and bowled. Tahir got wrong footed there. It is short and on middle, the ball seems to stop in the surface. Riyan looks to check his shot but till then the ball hits the bat. Goes to the right of Tahir who is moving to his left. The long on fielder too can’t stop it and it results in a boundary. Second in the over. TOSS: Chennai Super Kings win toss and elect to bowl first against Rajasthan Royals. 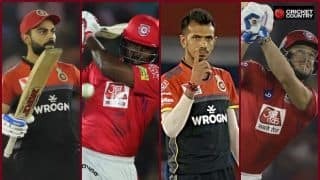 Sanju Samson returns for Rajasthan Royals, so does Jaydev Unadkat and a debut for Assam’s Riyan Parag, a former India U19 star as well. For Chennai, Scott Kuggeleijn and Harbhajan Singh miss out. In come Shardul Thakur and Mitchell Santner. 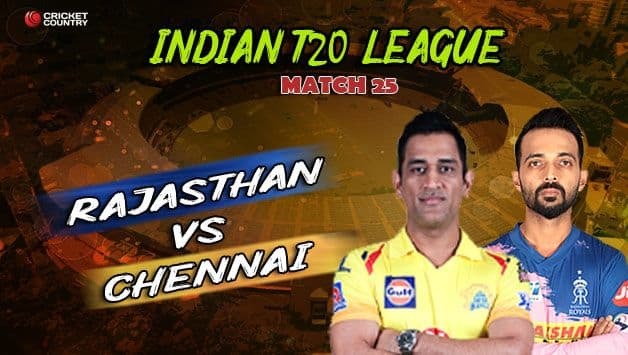 Hello and welcome to our live coverage of Match 25 of the IPL 2019 between Rajasthan Royals and Chennai Super Kings at the Sawai Mansingh Stadium, Jaipur on Thursday. 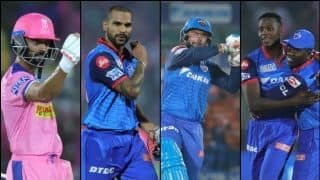 Rajasthan Royals have lost four of their five matches so far and sit at the seventh spot in the IPL points tally among eight participating teams. Chennai Super Kings have won five of their six matches with one defeat and are at the top of the standings. The two teams will face off in a mismatch of sorts. On current form, this should be a cakewalk for CSK. 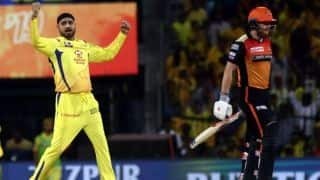 But RR would fancy their chances given how close they came to beating CSK in their first meeting last month when they lost by eight runs in a tough chase of 176. Despite their struggles, RR can hope to match them. For starters, it will be played on their home turf. Playing at home can be a massive advantage as CSK have proven with their unbeaten track thus far at Chepauk. RR can turn their own den into a fortress, provided they take some learnings from their latest opponents. RR have shown promises in their defeats too but failed to translate them into wins. Their only win has come against fellow laggards Royal Challengers Bangalore. 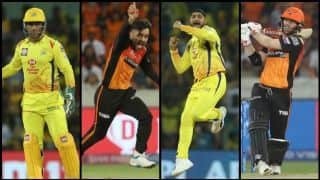 What can they do to stop CSK juggernaut? Bat better. On bowling friendly tracks, especially those assisting spinners, Chennai have been a step above everyone. 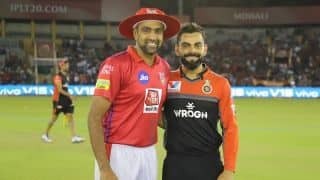 Rewind to their clash against Delhi Capitals at Feroz Shah Kotla earlier or just to the Monday night meeting with Kolkata Knight Riders. Their spinners have strangled their opponents. Spin has obviously been their biggest weapon. Their pace department looked a bit shaky which seems to have sorted itself out since the arrival of Scott Kuggeleijn and an in-form Deepak Chahar. Their batters have shown sensible approach on difficult wickets. Give them one full of runs and expect the likes of Shane Watson, Suresh Raina and MS Dhoni to explode. To RR credits, they do have a decent attack. Shreyas Gopal has been leading their attack, bamboozling the best but has found little to no support from others. 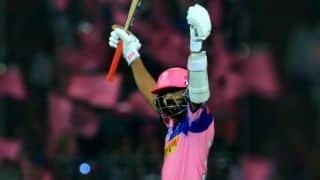 In their last match at home against KKR, RR batsmen struggled indicating a difficult pitch before the visitors threw those observations out of the window with a blazing chase. Clearly, they are now struggling. 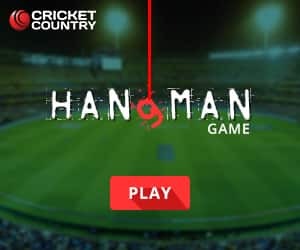 Their captain Ajinkya Rahane may have put up a brave face in saying to not panic yet but one more defeat and their campaign might be as good as over.